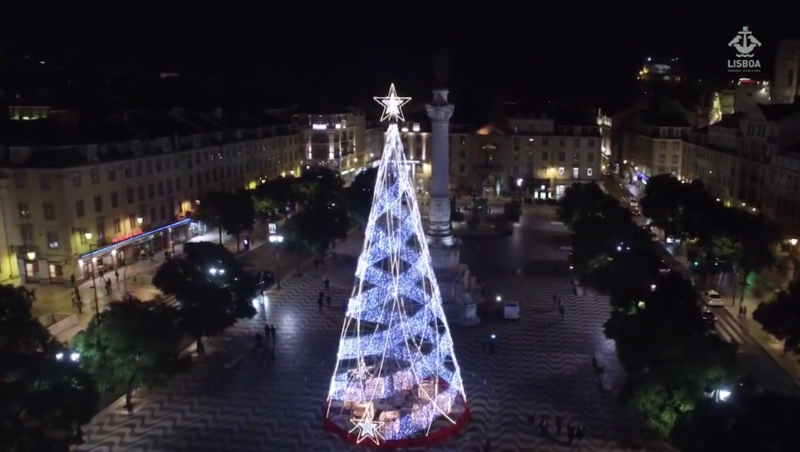 For many, the Holiday Season is inextricably linked to certain wines. A bottle of Port is a must for many wine lovers' holiday checklist, but there are other wines that also go perfectly with this season. Not all wines are adequate for every year season, some are perfect for warm weather, such as the fresh Vinho Verde and Rosé, and other wines are perfect, or more appropriate, for the cold seasons. 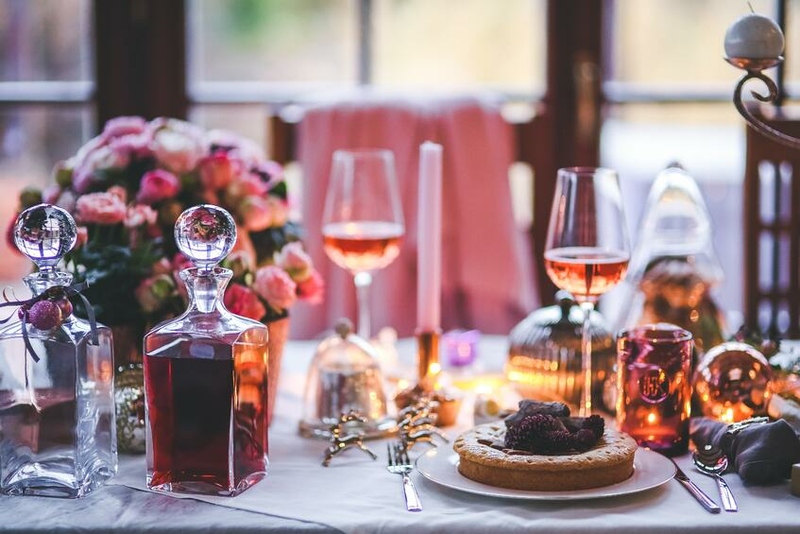 In this article, we bring you a few wine suggestions for the chilly period of the year, in particular for the holiday season. 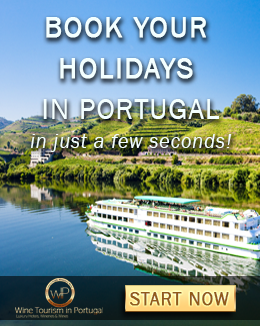 Port wine is born in one of the oldest wine regions in the world, the Douro region in Portugal, and is one of the most famous fortified wines in the world. This famous wine is fortified for a historical reason. The first producers needed to ship it to England and because of the long journey, they had to come up with a way to longer preserve it. They found out that by adding brandy it would stop the fermentation process making it last longer and, eventually, it made the wine taste even better, giving birth to that flavour we all so well know today. 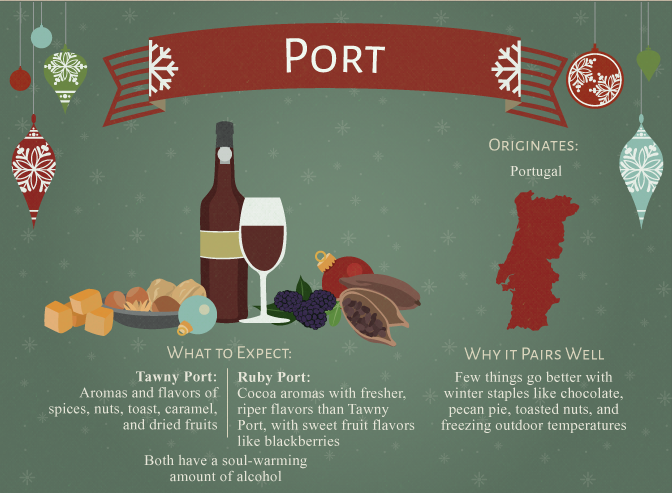 Due to its fortification, Port wine provides a warming alcoholic feeling, making it an excellent suggestion to keep you warm during the colder seasons and, definitely, a great wine for the holidays. Madeira wine is also one of the most famous fortified wines in the world and is produced in Madeira island, also in Portugal. Can you guess why the producers needed to fortify it? 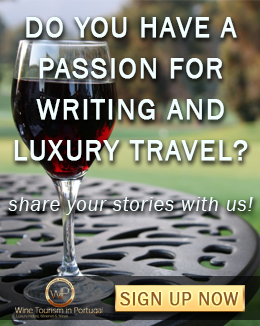 Yes, for the same reason as Port wine, to last longer and to survive the long journeys overseas. 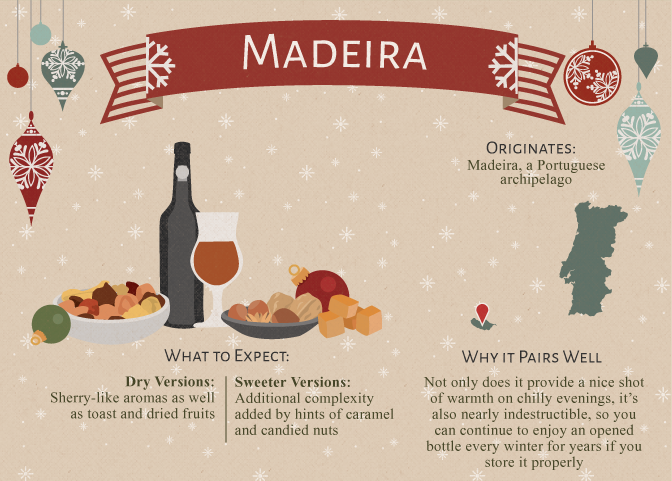 And, as it happens with Port, Madeira wine also delivers quite a strong alcoholic level which makes it another great option to warm us up through the cold days, making it our second wine choice for the holidays. 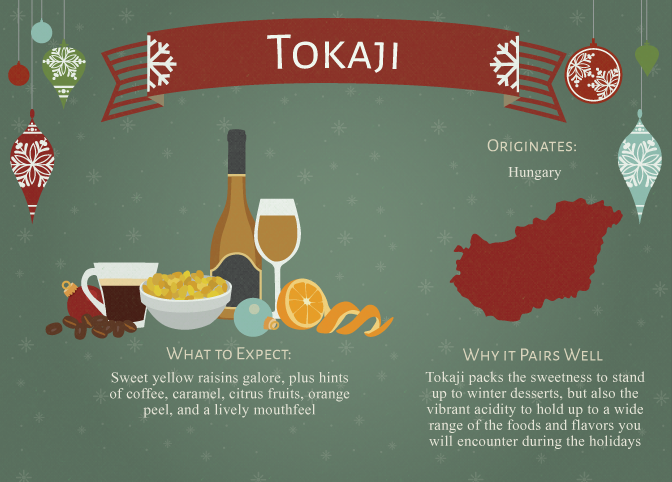 Tokaji wine is produced in Hungary in the Tokaji wine region, mostly known for its sweet wines. The grapes from this region are affected by a special fungus that dries the grapes and turns them into raisins. On a curious note, this wine produced from the Tokaji grapes is even mentioned in the Hungarian national anthem. The result is a luscious, silky sweet wine with an incredible balance of fruit, acidity, and residual sugar, making it an excellent choice to pair with a winter meal. 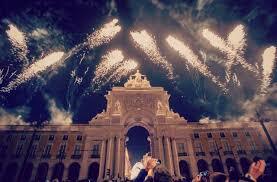 Practically, everywhere in the world, people celebrate the new year's arrival with a glass of champagne. It adds class and the cork popping cork ritual also adds fun to this festive moment. There are several types of champagne that vary according to its sweetness. From the less to the sweetest we have Brute Nature, Extra Brut, Extra-Sec, Sec, Demi-sec, and Doux. The drier ones are more in trend these days, which is why the doux type is a bit harder to find. 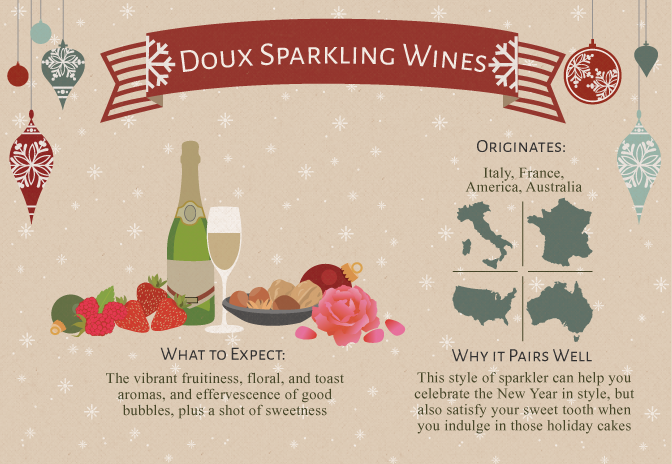 The sweetness of the doux champagne makes it a great choice to pair with the holiday pastries. 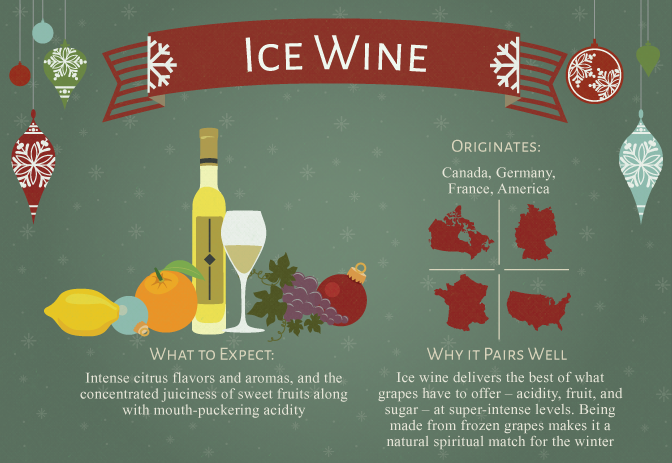 You are probably wondering "what is ice wine?" It's exactly what your are thinking of, wine made from frozen grapes. These grapes are harvested during the night when the temperatures are cold enough to freeze them. The ice eventually dries them up which contributes to a higher level of acidity and sugar, which in turn results in a sweeter wine. The main difference from this dessert wine to other ones, such as the Tokaji, is that the freezing process happens naturally and before the fermentation. Ice wine for the ice season, a perfect wine match for the holidays. What about you? What are the wines that usually keep you warm during the holiday season?